When using educational games as learning tools in and out of the classroom, we encourage teachers and parents to break the rules! With a little creativity, you can turn existing games into a classroom or homework activity that targets the lesson at hand. Last year, we were fortunate to have a teacher in Pennsylvania with over 20 years experience in elementary school education design lesson plans using our educational games. As a part of an ongoing series of posts, today we will be covering our creative storytelling game Tell Tale. 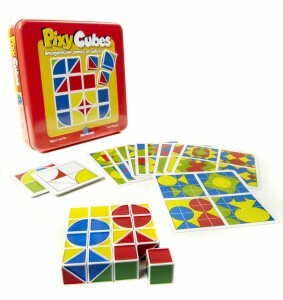 Pixy Cubes is a versatile game that involves memory, speed and creativity, depending on how you play. 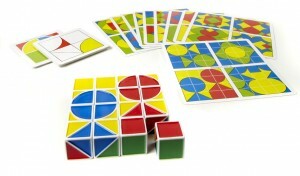 The game contains 16 cubes with green, red, yellow, and blue sides—either as solids, half and half, or crescent shapes. Players use the cubes to complete patterns on the challenge and design cards, either in a race or by memory. It’s similar to Tangrams, but in 3D! Divide up the cubes so all players receive one of each cube pictured below. On a worksheet, there are 4 lines of patterns each with an outline of the next cube. They have to rotate their cubes to find which one fits the pattern and place it on the outline. Divide up the cubes so all players receive one of each cube (see picture above). Then have the students decide on a 16 cube Design Card to recreate the pattern of. Together they have to recreate the pattern using their cubes. Another activity for one student similar to Design Games is to use mirror images to extend the pattern. This pattern is two cubes high and eight cubes long. Students could use four Pixy Cubes to create one of the challenge card patterns. Then they are to extend the pattern with the second set of four cubes being a mirror image of the first four cubes. The third set of four cubes will be a mirror image of the second set. The fourth set will be a mirror image of the third set. Another activity for one student similar to Design Games is to use mirror images to create a tessellation that is a 4×4 square using all 16 cubes. Students could use four Pixy Cubes to create one of the challenge card patterns. Then they are to extend the pattern with the second set of four cubes being a mirror image of the first four cubes either to the left or the right. Then they are to place the remaining eight cubes below in a mirror image of the first eight cubes. This will make a 4×4 cube square. Speed Game with 6 players: Divide students into two groups of three students in each so there will be two games being played at the same time. Each group gets six of the Challenge Cards and two sets of cubes as explained in the Speed Game. Play begins in each group with two players and one observer who will rotate into the game in each of the rounds of play. As soon as one of the players completes the pattern, the observer checks to see that it is correct. If correct, the observer trades places with the first winner, scrambles the four cubes, and tries to beat the other player for second place. Play continues with the winner of the first round being the new observer, who will reenter the game when the second round has a winner. Players keep track of points. Play continues with winner of each round being the observer and re-entering the game as new winners happen. At the end of six rounds the one with the most points is the winner. Get a sneak peak at our 2014 NEW games!